Her are some of the best carpet cleaners you can get for small and large messes between professional cleanings. 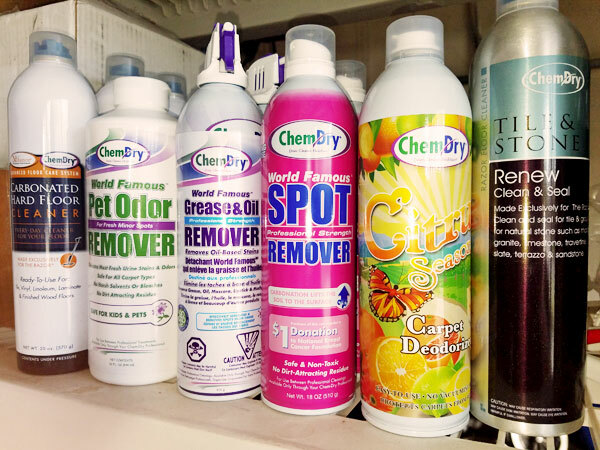 Chem-Dry of Tampa FL stocks the complete line of World Famous cleaning products. This carpet cleaner is a green certified carbonated cleaner that can remove tough water based spots from your carpet and upholstery. More than just bubbles. This cleaner has several natural ingredients the loosen and emulsify soils in your carpet for easy removal. Like the World Famous Spot Remover, Grease and Oil remover tackles tough oil based spots from foods and mechanical grease. Ever have your son pour vegetable oil on the carpet? I have. The World Famous Grease and Oil Remover took it right out. It's also great for oils spots on microfiber and other upholstery. This might be my favorite carpet cleaner in the World Famous line of cleaners. It works like nothing else in neutralizing pet odors in your carpet. If your beloved pet is having accidents on the carpet or rug Pet Odor Remover quickly and easily prevents staining or odor build up. If you find a urine spot on your carpet just blot it up and pour the World Famous Pet Odor Remover right on the spot and leave it to dry on it's own. I have used this product for years and it get the urine out every time. Yes, it works on human urine too. It's great for mattresses. If you're in need of a reliable set of carpet cleaners to help keep your home clean and healthy Chem-Dry's World Famous line of carpet cleaners cannot be beat.